The publications of Studio Michal Meron, are based on Jewish themes and the Jewel of the crown is without any doubt The Illustrated Torah Scroll which includes the high lights of all 54 weekly lectures (Sidrot) of the Torah, interpreted into artistic panels by Michal Meron. Studio Michal Meron is a publishing house located in Israel with strategic business associates in the USA and Europe. During the last 18 years it has developed working relationships with schools and institutions worldwide. 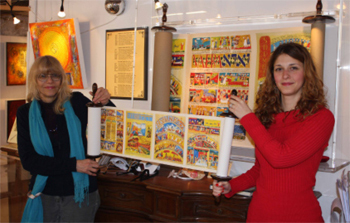 The Illustrated Torah Scroll is already used by schools, synagogues, temples and Jewish institutions as a teaching tool and a fundraising program. There are several ways for a community to obtain one. Please be in contact with us via email and we shall be happy to provide specific information on how to receive an Illustrated Torah Scroll.